I finished my first knitting project in over 20 years. 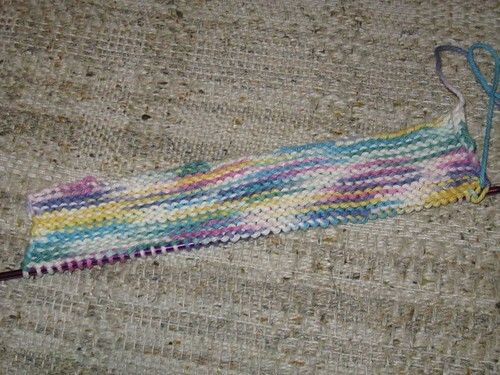 On Tuesday night I decided to be a little adventurous and try to bind-off JSL’s scarf by myself. I did it with a quick IM tutoring session from my favorite Squishy Yarn Guru. I went off and accomplished it. 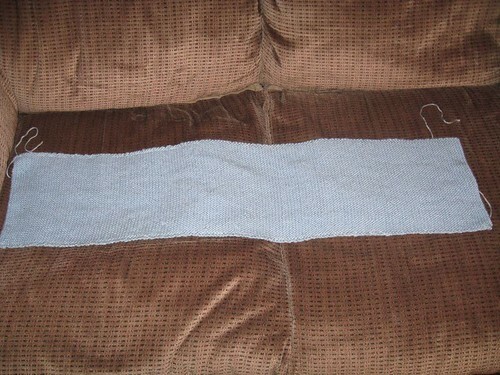 Below is scarf almost ready to keep JSL warm. Now the only thing left to do is weave in the ends and wrap it around JSL’s neck to keep him warm. He seemed to like it when I did a test run. He enjoyed eating petting it. Meanwhile as I was taking photos of the scarf my little guy was playing with his food. Here is a different sort of view of the scene. 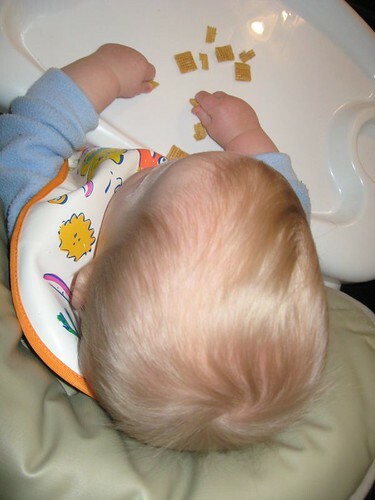 Please note the static in his hair – ugh winter stinks even for babies in the frizz department! Since Laura is not feeling well (feel better Madame Guru), she sent me to a website to try to reteach myself how to purl (it’s been WAY over 20 years since I tried that). After some swearing under my breath trouble at first, I finally got it going thanks to the video. Later at night I mentioned to Laura that I was having problem with the knit row, after purling. She said something was obviously wrong. So I watched again and figured out that I was wrapping the yarn in the wrong direction. Since it is SO subtle (you really have to look and follow the stripes to see the mistake) I opted to just keep knitting. 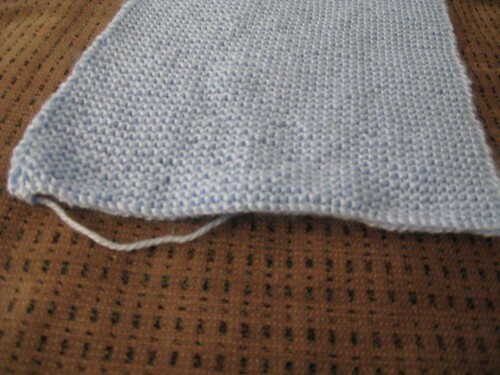 Purling is getting easier, but it is more awkward and easier to drop a stitch if you are right handed. 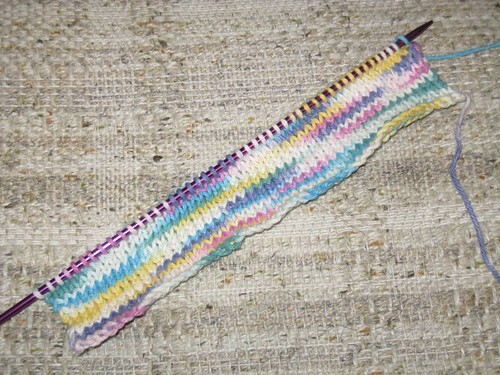 Here is the start of my first wash cloth that I am making for myself (thus the reason I am not redoing the tiny ooops). Mistake not seen here since I started the correction afterward. So off I go to do a few things while the little guy is napping. « Wordless Wednesday – Tis One Very Messy Face! Wow, you did a great job!! I have always wanted to learn to knit. I just don’t think I could get the hang of it…it looks so complicated!! But you did great!